Most of us can agree that Formula One needs some sort of cockpit protection on its historically open race cars. But after two years of development, not everyone agrees on the “halo” F1 decided to go with. So, the FIA decided to enlighten us with all of the reasons why it chose this strange, wishbone-looking thing. The FIA, F1’s governing body, will be more than a year late on adding cockpit protection when it mandates the halo for the 2018 season. Most drivers called for cockpit protection by the 2017 season, which, if you hadn’t noticed, is now. But development was slow and F1 only tested a few devices over that rather long time period, including the halo and two different types of windshields. It culminated in a weird, quick turnaround earlier in July, when F1 announced and then immediately tested a windshield with Ferrari driver Sebastian Vettel. The windshield looked great, but things didn’t go well on track—it made Vettel so dizzy he took it off after a couple of laps. A couple of days later, the FIA announced that the halo won the big competition and would be mandated in 2018. After two years of drivers strongly pushing for cockpit protection, the decision felt like it went down in the course of a week. It was strange, and plenty of people weren’t thrilled about the decision to go with the halo. Nine of the 10 F1 teams reportedly voted against it, too. But it didn’t take the FIA long to defend itself by posting a long explainer on its decision: “Why Halo is the Best Solution.” The post started with an introduction about how the FIA’s known of the need for protection for a long time, and how drivers approached the governing body in 2016 to get things rolling after more than one fatal open-wheel accidents due to head injury. While static tests of the device continued, other solutions were simultaneously explored, particularly the ‘Aeroscreen’, a windshield mounted on twin pillars attached to the coaming on either side of the cockpit. The system was tested in free practice at the 2016 Russian Grand Prix but while it was successful in some areas, further testing raised concerns as to the effectiveness of the device. By contrast, tests of the Halo continued to prove successful. Centring on three significant major risk types, car-to-car contact, car-to-environment contact and external objects, tests revealed that in the case of car-to-car incidents the Halo was able to withstand 15x the static load of the full mass of the car and was able to significantly reduce the potential for injuries. In car-to-environment tests it was established that the Halo was able to prevent helmet contact with a wall or a barrier in many cases, using a selection of previous incidents as a reference. Finally, in the case of external objects the Halo was found to successfully deflect large objects away from the cockpit environment and also demonstrated an increased net level of protection against small debris. Despite the success, in July of 2016 the F1 Strategy Group agreed to defer introduction of a cockpit protection system in order to provide more time to conduct track testing with the Halo device and to explore emerging alternative solutions. 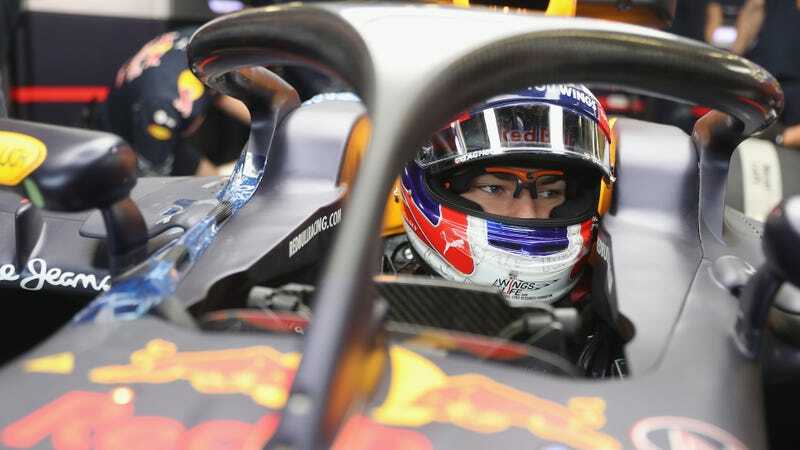 However, while implementation was deferred, the Strategy Group reaffirmed its commitment to the introduction of a protection system by stating it was “agreed unanimously that the 2018 season will see the introduction of frontal cockpit protection for Formula One cars in order to significantly enhance the safety of drivers.” The Halo remained the preferred option. Intensive track tests took place across the second half of the 2016 Formula One season with a wide number of teams and drivers assessing the impact of the device on visibility. Simultaneously the FIA maintained its commitment to the introduction of a device for the 2018 season. Maybe they’ll make it look a little better by then, too.